Just a few weeks after the Operation Commander of the EU Naval Force, Rear Admiral Bob Tarrant, issued another warning about the on-going piracy threat, there have been two more piracy related incidents off the Somali coast. The first incident involved EU Naval Force German frigate, FGS Niedersachsen which prevented 10 suspect pirates from getting far out to sea. The second incident was 460 miles south east of Mogadishu, when a merchant ship had to repel an attack from 5 armed pirates. FGS Niedersachsen first located 2 small vessels – a whaler towing a skiff, close to the Somali coast. The warship’s crew was able to observe that as well as 10 men, the whaler was also carrying over 10 fuel barrels and 2 long ladders – equipment that has been traditionally used by pirates to launch attacks on ships at sea. When the German frigate approached to carry out further investigations, the men in the whaler were observed dropping the ladders into the sea, before heading back towards the shoreline. 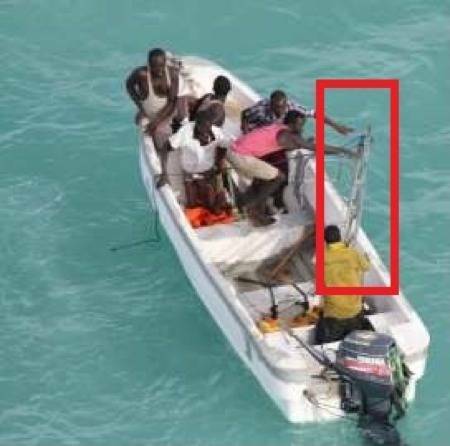 As the suspect vessels made their way through the surf to get back to the beach, approximately 80 people were seen watching from the land, with some wading out to assist the suspect pirates to drag their boats back on to the beach. The attack was on a Hong Kong-flagged chemical tanker, enroute from Saudi Arabia to Mozambique, which was fired upon by 5 men using automatic weapons in a fast-moving skiff. The private armed security team on board was able to repel the attack. There are no reports of any injuries following the attack. Naval forces immediately closed the sea area to locate the suspect pirates.